The Kuma Foundation is supporting Yokohama Triennale 2017 as a ticket supporter. The Yokohama Triennale is an international art exhibition that is held every three years. 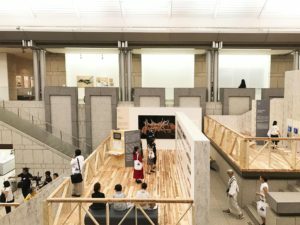 Yuriya Sumida, one of the first batch of Kuma Foundation scholarship students (architecture), was responsible for the design of the exhibition spaces at the Yokohama Red Brick Warehouse No. 1. and the Yokohama Museum of Art—the main venues of the Yokohama Triennale. 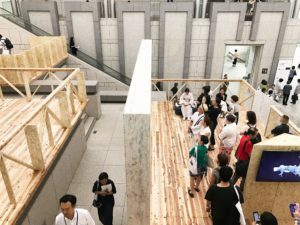 The exhibition space of the Yokohama Museum of Art’s Grand Gallery, with its key words of isolation and connectivity, was based on the idea of laying a new wooden floor on top of the original stone floor. The exhibition, which runs until November 5, features an extensive range of different exhibits by each of the artists involved. Don’t miss the opportunity to go and check it out.